The Bison Replacement Nylon American Flag is a heavy-duty flag for indoor or outdoor use. Double stitched with heavy-duty grommets. 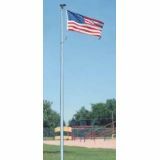 The Bison Patriot Flag Pole features a 5" diameter base and rises 25' high allowing attractive flying of the American Flag, School, or State Flag. System includes external rope lanyard and hardware, in-ground base components and flag.